A few words can have a major impact - check out these insights and reflect on your own approach to living life. 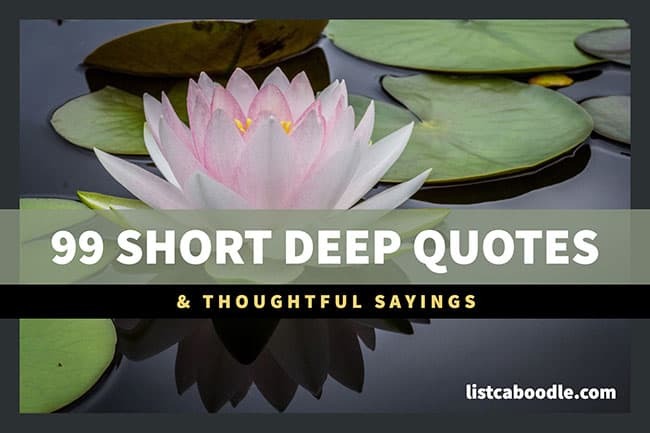 These short deep quotes cover a wide range of topics that address every day living including relationships, life, culture and politics. A review of this collection will put your brain to work, and hopefully, you’ll walk away with a new insight or two about your approach to life. In the spirit of “less is more,” we present these thought-provoking short quotes. What labels me, negates me. Check out these short quotations for tattoos. I feel safe in white because deep down inside, I’m an angel. Don’t be ‘a writer’. Be writing. He who is untrue to his own cause cannot command the respect of others. It is not I who am strong, it is reason, it is truth. Deep down, I happen to be very shallow. When love prevails, fear departs. Never regret something that once made you happy. Never make fun of someone who mispronounces a word. It means they learned it by reading. The prettiest eyes have cried the most. He who loves, loves you with your dirt. Politics is in a crisis because it’s separated from our deep humanity. What gets us into trouble is not what we don’t know. It’s what we know for sure that just ain’t so. One’s art goes as far and as deep as one’s love goes. Check out more short quotes about life, love, friendship and more. One who acts on truth is happy in this world and beyond. Tip: These quotations and sayings make great photo captions. You are on the short deep quotations page.